Scenic Foothills Community Council meeting, 7 p.m. Thursday, September 3, in the auditorium at Wayland Baptist University, 7801 East 32nd Avenue. Access via Old Muldoon Road off 36th Avenue, west of Muldoon Road. Everyone is welcome. See newsletter, agenda and minutes links above this post. Click here for map and driving directions. Join ALPAR and Alaska Botanical Garden to recycle types 2, 5, & 7 plastic pots. Please do not dump pots at Garden – annual event is one day only, 11 a.m. to 5 p.m. Saturday, August 22! Location: parking lot at 4601 Campbell Airstrip Rd., Anchorage, AK 99507. NOTE: One day only at ABG! Faltz Nursery, 1401 Labar Street, Anchorage, AK is collecting plastic pots throughout the summer. 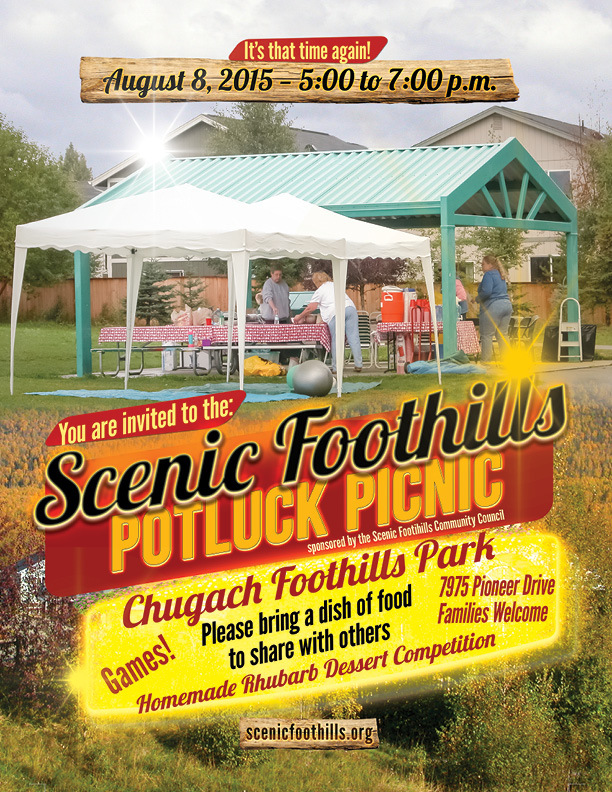 Come, meet your neighbors at Scenic Foothills potluck picnic 5-7 p.m. Saturday, August 8, in Chugach Foothills Park, Pioneer Drive at Muldoon Road. Family friendly. Please bring a dish of food to share with others. Homemade rhubarb dessert competition. Sponsored by Scenic Foothills Community Council. See you there!